I came across Harsh’s blog, ShoutMeLoud, two years back when I was looking for some help to fix a WordPress issue for my website. I liked the way he put so much content around blogging and WordPress on his blog. I asked him if I could submit a guest post and he agreed. Since I am passionately in love with credit cards and money saving hacks, I wrote one article on making $2500 with a credit card sign up in the USA. That was my first ever guest post on a tech blog. Later I covered Harsh’s blogging journey on YourStory. We became good friends and thought of running some experiments together but could not materialize anything because of lack of time. We both were busy with many other activities. Today I am starting to interview bloggers and entrepreneurs who are running their businesses with low investment and are making at least 100,000 rupees per month as passive income. Harsh is inspiring a lot of people to make money online through blogging. I was doing my job as senior software engineer in 2009, in one of the top MNC in Gurgaon after passing my computer science engineering from a premier engineering institute. In 2009, while I was crying for a salary increment of 10%, Harsh started building his online assets. I love transparency and share my annual income reports (Rs. 200,000 per month), so does Harsh. Isn’t it fantastic? Earning more than 22,00,000 rupees from online work! I know, I know, he is a top blogger of India and he has millions of traffic. But do you think he was a top blogger with in 2009? My friends who are still struggling with their job, would remain poor even if they start earning 50 lakh a year because they sold all their time to their employer. They don’t have time for their kids and family. My friends who are stuck in their jobs are still missing the family functions and marriages of their friends, because they are overloaded by the job work. 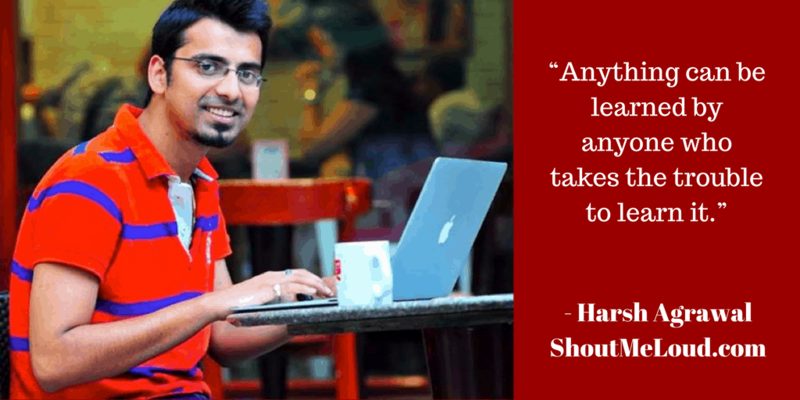 People like Harsh are inspiring people to become free from 9 to 5 job. He had thought of starting a blog since 2006 and it took him 2 years to actually do it. Harsh started blogging part-time, as he still had a full-time job. He initially pursued blogging as a hobby because it made him happy. That enjoyment is what made him want to continue and get even better as a blogger and online marketer. He started blogging with Blogspot, but he quickly move to a self-hosted WordPress blog when he realised the power of blogging. He met with an accident in 2009 and had to leave his job at a call center. I invited him today to share his journey with us. Harsh, would you please tell us more about the incident, how were you feeling after your loss, and how motivated yourself? A week after the first diagnosis, the doctor told me my fracture was not a normal one- it was called a lisfranc fracture. Even now while recalling this story to you, I can remember the emptiness I felt as tears rolled out of my eyes. More than me, my parents were also sad. For the first 2 days, I was angry & frustrated. Imagine yourself at the age of 22 & you lose one of your biggest functions- walking. It took me 2-3 days to notice the sadness in people around me & realize that their sadness was because of me. This is when a strange realization of “Am I the only one with the problem?” changed my whole life. Rather than sulking down for my loss, I accepted my faith & started focusing on what I could do from there. I was in bed for a few months, and rather than wasting time, with the intrinsic motivation & support of my loved ones, I turned that accident into a life-changing opportunity. Later on, I met an orthopedic surgeon who used to treat athletes & he performed an operation that fixed my left foot for good. Now I can walk & smile at the same time. How was your journey of that first year of blogging? I assume that you must have struggled with low traffic and months with a few dollars income. 2008-2009 was a golden time for blogging. I never cared about money at that time. In fact, for the first few months, I was not even aware that my blog could make me money. My biggest wins were those few comments & those few social media shares I would get on occassion. Blogging back then was like playing cricket with your buddies. It was not about winning or losing but having a good time. What keeps you motivated when you don’t see the results as per your expectations? I always believe in one thing: I started from zero, and if I need to, I can start all over again. I will survive, as long as I have a brain in my head & energy in my body. What was your darkest period of life? How did you overcome your obstacles? I had everything one could imagine: Family, good career, house, car, money, and all the time in the world. Can you imagine that being the darkest period of someone’s life? How much more money do I need? How many more possessions do I need? I was sick & tired of this constant flow of information day & night. It was feeling like an unstoppable journey with no meaning or destination. This is when I did a meditation course. I maintained noble silence for 10 days. That was it. That meditation course (called “Vipassana”) answered everything I needed to know. Those 10 days of noble silence & continuous meditation taught me enough to pursue my passion with joy for many more years to come. How much do you work every day? How is your daily schedule? Can you share a few productivity hacks for our readers? For people like me who work from home, maintaining a schedule is the biggest challenge. I focus on working at least 6-7 hours a day & I work using the Pomodoro technique. I maintain a journal called a productivity planner which helps me manage my day & week to come. Pomodoro technique: In this technique, you divide your work into 2-3 blocks. Every block consists of 25 minutes & you can use a timer tool like Focus booster to time yourself. When you start the timer for 25 minutes, you focus only on doing one task. No matter what, you won’t do anything else unless it’s an emergency. This requires practice initially, but once you master it, you will start getting things done much more efficiently. Start the day with important tasks: Earlier, I used to schedule my meetings in the morning or afternoon & later I realized this was not productive. Especially in team meetings, discussion takes away too much of my energy & by the end of the day I couldn’t focus on real stuff. I start my day with important things first which is usually planning and writing. Most of my creative work is done before 3 P.M. The evening time is mostly for meetings or other mundane tasks. Disable push notifications: This is another hack that I use to ensure I don’t get distracted. For all of my apps (it doesn’t matter how important the app is), push notifications are disabled. This ensures that I never get distracted by that notification sound & use my phone only when I need to. Speed up mouse speed: This technique I picked from Noah of Sumo.com. Just by speeding up my mouse speed to maximum, I save a lot of time in the long run. It takes 1-2 hours of getting used to, but it’s completely worth it. I take a steam & sauna twice a month. I maintain a gratitude journal. I don’t do business with people who build or sell crappy stuff. Usually people who work only for money are not my ideal people to work with. What are the top 5 software tools that you can not live without? Slack: This is what we use for team communication at ShoutDreams. SEMrush: My day-to-day SEO tool. SocialPilot: Social media automation tool. PayPal & Payoneer: Helps me receive payment from overseas. Dashlane: Helps me use unique passwords for all of my logins. People got confused with so many affiliate programs available in the market. Which are two reliable affiliate networks for India and two international? Flipkart & Amazon are the two best networks for Indians to get started with. For the international audience, there are many other great ones. Two I like are ShareASale and Commission Junction. If you had to start a new affiliate website today, which niche would you choose? There are many niches out there & every niche offers a way to make money. Do remember, the people at the top “1-10” enjoy the maximum amount of cash. Strive to become one of those on the top. According to you, which can be profitable niches for affiliate marketing for an Indian audience? More than jumping into any niche which looks lucrative, one needs to really be ready to either learn about that niche or have a direct or indirect connection with the niche. Health & parenting are two niches which can be started by a lot of women & will keep growing over time. Fashion and Beauty has a lot of potential in India. Tech & online marketing are evergreen markets. Finance is difficult but if you love it then you can grow as profitable niche. In short, If you are ultra smart (which many of us are), you can get into any niche & make money. Harsh shared some personal moments and great insights from his blogging journey. I would like to say Thanks for his time. If you are also planning to start your career as a professional blogger then here are some pointers for you. #1. Start your website or blog – step by step guide for non-technical people. #3. Free Tools and business resources that I use personally. Found the interview helpful? Share with a friend to help him/her with starting up. Wow! That’s very good article. I personally like to use wordpress platform.